She is the host of Money Class a financial program featuring on the new Oprah Winfrey Network (OWN). On January 24, 2012, one of her episodes titled “Money Disaster” aired on OWN as she is seen encouraging one of her audience who lost everything to an investor scam. The woman had invested $550,000 her entire asset with one Mr. Roberto who was arrested by the FBI and jailed for duping his clients to the tune of millions. Then comes another audience a mom who buys things that she doesn’t need; she advised her to get it together, stop spending unnecessarily and save for the future. Finally, there was a military mom who after returning from deployment could not find a job to provide for herself and her son. She did not only help the single mom find a job as a waitress, she also set her up with a renowned photographer so she could pursue her passion for photography. These are the success stories Suze is known for. 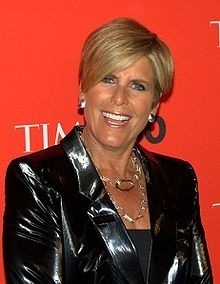 Suze Orman was born in Chicago on June 5, 1951. She is a financial advisor, a motivational speaker and the past few years a television host. She received a BA in Social Work and in 2009, she received an honorary degree of doctor of humane letters from the University of Illinois at Urbana Champaign her alma-Mata. While in her 30s she worked as a waitress in California before becoming a financial advisor for Merrill Lynch. She later became the vice President of investment at Prudential Bache Securities before finding the Suze Orman Financial Group in 1987, where she was director until 1997. In 2007, Orman created an interactive TV show called “Can I Afford It?” In 2008, she gave away one million electronic copies of her publication titled “Women and Money” and after series of appearances on the Oprah Winfrey show, she began hosting her own financial advice show called the Suze Orman show. In January 2011, she was a guest on “Oprah Allstars” show; She writes a financial advice column for the O magazine and she was a contributor to Yahoo “Money Matters” and the Philadelphia Inquirer, Lowes Money Works and Your Business at Home Magazine. As part of her successes, she has written nine New York Times Best Sellers; Orman has also written and co-produced, and hosted seven PBS specials based on her publications. She won the Daytime Emmy Award in 2004 and 2006 in the category of Outstanding Service Show Host based on her PBS specials; The Laws of Money, The Lessons of Life and The Money Show for the Young, Fabulous, and Broke. Orman has used her show to advise and help many American in financial trouble get back on their feet. She is well-known for telling it like it is when it matters and she is never afraid to critique bad financial management. She is a force to reform how people spend money that puts them in debt or make them slaves to the credit card companies. She has offered help on issues such as; loans, mortgages, the stock market, capital gains and other financial matters. To help people make better financial judgment and decision on credit card use, Orman offered a new Prepaid Debit Card Approved Card in 2012. She is currently fighting hard to ensure those who use prepaid card can build their credits and Fico scores which so far, can only be done through credit card use. Many have called her proposal a financial empowerment while some have offered negative criticism of her idea as a financial “rip-off”; irrespective of the differing views, Suze Orman remains a force for reforming both lending and spending practices. Thanks for visiting and for having such a positive view of Suze.